Husband and wife duo Thompson Square, comprised of Keifer and Shawna Thompson, are set to perform in Artesia Sunday night. The duo has released two albums which have produced a combined eight hit singles on the Hot Country and Country Airplay charts. Of these singles, two — “Are You Gonna Kiss Me or Not” and “If I Didn’t Have You” — reached No. 1. The duo has also topped the charts in Canada and Australia. “It’s really an honor to have been the first number one song on Australia’s first country chart,” Keifer said. The couple met at a singing competition, later formed a duo, and released their debut single, “Let’s Fight,” in mid-2010. Thompson Square’s first single in nearly a year, “Trans Am,” was released in March. Keifer was born and raised in Miami, Okla., and Shawna is a native of Chatom, Ala. The couple makes their home in Nashville now and are busy readying for a new addition to their family. On Aug. 4, the duo revealed they were expecting their first child, a son due in January. 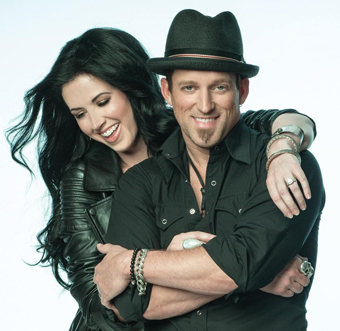 Thompson Square will be in concert at 7 p.m. Sunday at the Eddy County Fairgrounds. Tickets are $40 for general admission, $75 VIP/reserved, and may be purchased online at www.artesiaartscouncil.com or at the Ocotillo Performing Arts Center box office.